Lennar’s development at Hunters Point and Candlestick Point is one of three megaprojects that will bring thousands of units of much-needed housing to San Francisco. Rendering courtesy Lennar Urban / Transparent House. After years of legal and financial delays, San Francisco’s three biggest residential projects have taken steps toward becoming reality. Together, they make up most of the proposed housing units in the city’s construction pipeline. Lennar’s first 88 units at the Shipyard (a.k.a. Hunters Point Shipyard) are nearing the end of construction after years of planning, financing challenges and the Navy’s environmental cleanup. Lennar also recently landed an anchor tenant for the major shopping center planned nearby at the former site of Candlestick Park, which was approved earlier this year. Parkmerced and Treasure Island were both stalled by legal action but have prevailed in court. In October the California Supreme Court denied review of the city’s environmental review of Treasure Island, and in November it declined to review the last appeal by Parkmerced’s opponents, putting both projects on track to move forward. Through these three projects alone, San Francisco is set to add nearly 25,000 housing units over the next two decades and put a good dent in the city’s housing shortage. SPUR has championed the “megaproject” model of planning at these special opportunity sites and is excited to finally start to see results. Located in the southeast corner of San Francisco, the 490-acre Hunters Point Shipyard was a working Navy shipyard from 1941 to 1974. After the shipyard’s closure in the 1980s and planning during the 1990s, the city approved a redevelopment plan in 1997 and chose Lennar as the master developer in 1999. 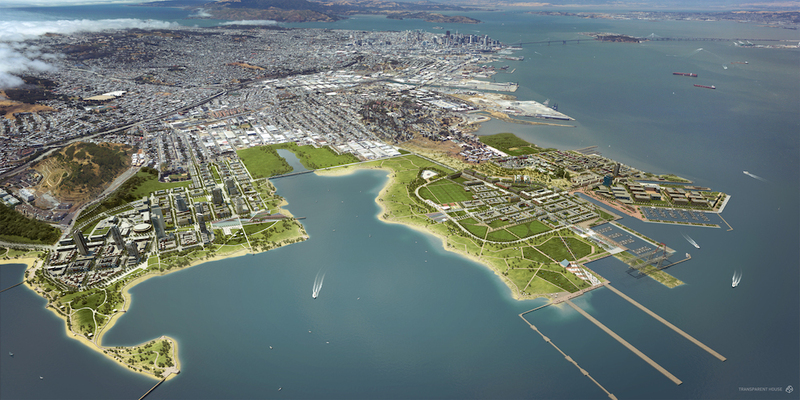 The plan was later amended to integrate planning for 280 acres at Candlestick Point into the process. 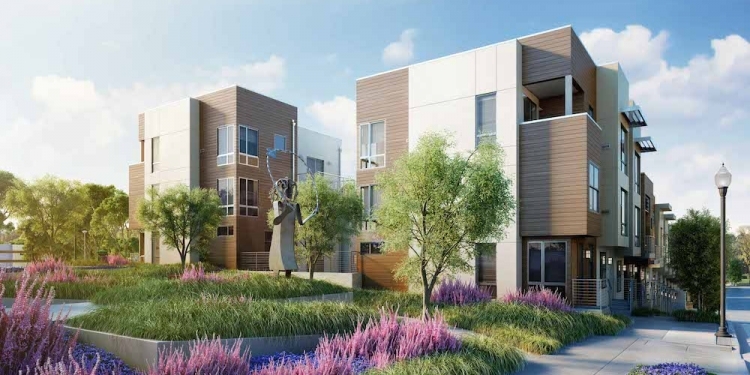 In total, the Shipyard and Candlestick Point will include more than 12,000 units, of which over a third will be offered at below-market rates. HOPE SF is working with HUD’s Choice Neighborhoods program to redevelop the Alice Griffith public housing development, which will start construction in January. Due to their location on the edge of town, many of the market-rate units will also be priced at levels well below the going rate in central San Francisco. The Shipyard and Candlestick Point will include more than 3 million square feet of green and clean technology research and development space, over 300 acres of parks and open space and a 500,000 square-foot outdoor shopping center that will open in 2017 with Macerich as a partner. The project has been slow going for the 40 years since the Navy ceased operations due to negotiations between the city and the Navy over the environmental remediation effort required. Currently, the Navy’s cleanup efforts are ongoing as it completes the remediation and transfers parcels to the city in phases. Eighty-eight market-rate units will open in the next few months, and the next 159 units of this phase — including a 66-unit affordable project by AMCAL — will also wrap up in 2015. After getting approved early this year, the HOPE SF project at Alice Griffith will start construction in January 2015. The original Parkmerced complex was built in the 1940s by MetLife to provide middle-class housing in San Francisco. Spanning 152 acres on the southwest side of the city, Parkmerced currently includes 3,221 units in 11 towers and dozens of low-rise buildings in a suburban configuration. The plan calls for the site to be redeveloped in four phases over 20 to 30 years to eventually include 230,000 square feet of retail, 80,000 square feet of office, 68 acres of open space and 8,900 housing units — of which 3,221 will continue to be rent-controlled and 900 will be set at below-market rents. ​The owner of the entire site, Parkmerced Investors Properties, received approvals from the Board of Supervisors in 2011. Opponents, including San Francisco Tomorrow and the Parkmerced Action Coalition, sued soon afterward, citing inconsistencies with city policies and flaws in the environmental review. A trial court rejected the suit and ruled in favor of the city in 2012 and, after being appealed, the ruling was affirmed this August by the First District Court of Appeal. This November the California Supreme Court declined to review the subsequent appeal, allowing the project to move forward. Financial issues have also troubled the project. In 2010 Parkmerced’s owners defaulted on their $550 million mortgage. But they have brought on new investors over the years, most recently in November adding a New York developer who now holds a majority interest in the development. The first phase includes 1,572 units, and more than a half-million square feet of underground parking is planned to break ground next fall. Many of the low-rise buildings and above-ground parking will be demolished, and several of the curving internal streets will be realigned to a more urban street pattern. When the first phase is complete, a free shuttle to BART will be put in place, and there are plans to eventually re-route the M Muni line through the development from 19th Avenue. Located halfway across the Bay to Oakland and linked to Yerba Buena Island, Treasure Island was originally built on landfill for the 1939 Golden Gate International Exposition. In 1942, the city traded the island site for the Navy’s Mills Field site, which would eventually become San Francisco International Airport. The Navy occupied Treasure Island until 1997 and still owns the land, which the city will acquire with $55 million from the developers, Lennar and Wilson Meany. The redevelopment project was originally approved by the city in 2011. Citizens for a Sustainable Treasure Island, led by Aaron Peskin, sued the city and developer, claiming the environmental study insufficiently reviewed the project’s details and environmental and traffic impacts. In December 2012, a trial court affirmed the city’s decision. Upon appeal the California Court of Appeals upheld that lower court’s decision this July, and the California Supreme Court declined to review the most recent appeal this October, putting the project back on track. The city still needs to officially acquire the land from the Navy, which should happen in the coming months now that the Navy has completed significant environmental cleanup of its operations. The development team plans to start work on the demolition and infrastructure work by fall 2015. 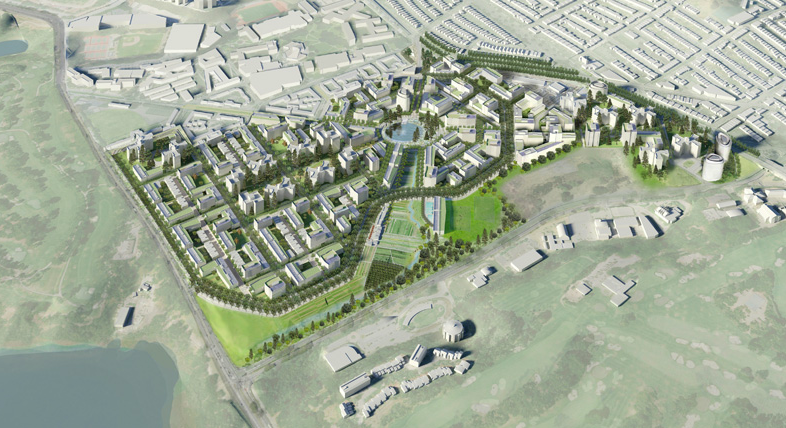 The first phase of four will include about 500 housing units and retail space. Ultimately, the project will grow over 20 years to include 7,000 to 8,000 housing units, of which 25 percent will be affordable; 235,000 square feet of new commercial, retail and office space; adaptive reuse of historic buildings for 300,000 square feet of commercial space; 500 hotel rooms; a new ferry terminal; and 300 acres of parks, playgrounds and open space. Between these three projects alone, nearly 25,000 housing units are now set to be constructed over the next two decades. Legal opposition, the involvement of major governmental agencies, the environmental remediation process, financing issues and the overall complexity of projects at this scale all played a role in delaying these projects to date. SPUR is very pleased to see these mixed-use megaprojects hitting significant milestones this year. Still, most of these developments have yet to obtain project-level approvals to work out the details, so the discussions aren’t over. But we’re well on our way to actually building these 25,000 units, which are an important part of the city’s plan to accommodate the growth that is already underway in San Francisco.